Two suspected armed robbers have been apprehended in connection with a s*xual assault on a 34-year-old woman in Gadan Eregi, Fulani Camp along the Bida Road, Niger State. 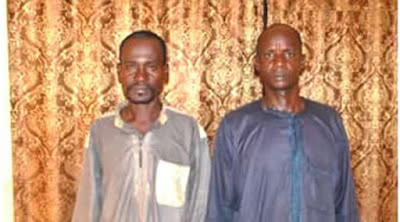 Northern City News learnt that the suspects, Umar Audu (50) and Umar Mohammed (40), both of Gadan Eregi, Fulani Camp, were arrested along the Bida Road by a team of policemen. They are attached to the Kataeregi Division in Katcha area of the state. It was gathered that the suspects, who reportedly attacked their victim with a cutlass and stick, demanded N400,000 from her. When she failed to meet their demand, they dragged her into a nearby bush and forcefully had s*x with her. One of the suspects, Audu, told the correspondent that they usually r*pe their victims who fail to give them money. He said, “If we stormed any house and the occupants refused to give us a substantial amount of money, we would have s*x with any female we found in that house as compensation. We don’t care how young or old; once our victim did not give us reasonable money, we are bound to perform the act. The Niger State police spokesman, Muhammad Abubakar, stated that the suspects had confessed to the crime, adding that they would soon be charged to court.